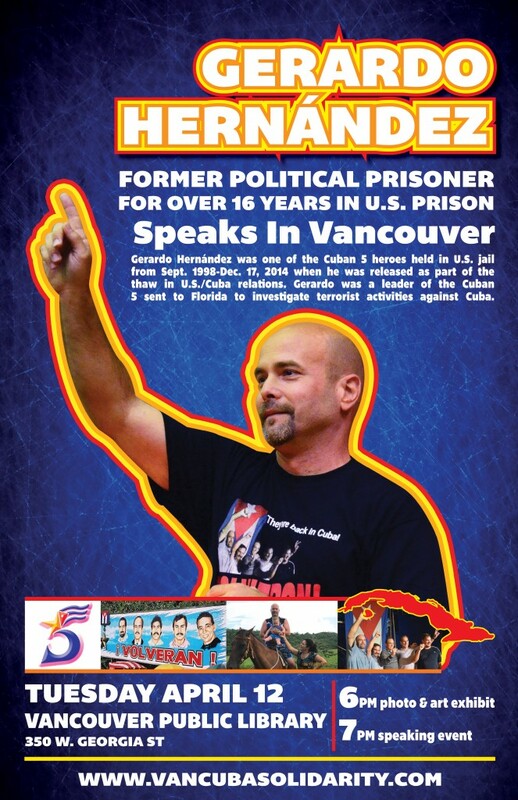 On Tuesday April 12, 2016 Vancouver Communities in Solidarity with Cuba (VCSC) and other organizations from across the city are proud to welcome Gerardo Hernández, one of the Cuban 5 formerly held in U.S. prisons to Vancouver! Gerardo Hernández was a leader of the Cuban 5 sent to Miami, Florida to investigate terrorist activities against Cuba. In September 1998, Gerardo, Rene, Ramon, Antonio and Fernando, also known as the Cuban 5, were arrested and held for 18 months in solitary confinement in the United States. Eventually they were charged and found guilty of trumped up charges such as, conspiracy to commit espionage and conspiracy to commit murder. Gerardo was given the most severe sentence, double-life. The United States wanted Gerardo live his life and eventually die in U.S. prison. Join us Tuesday April 12, 2016 at the Main Branch of the Vancouver Public Library at 6pm for an exhibit of Gerardo’s cartoons and other artwork dedicated to the Cuban 5. Then at 7pm Gerardo Hernández will speak, along with Javier Domokos, the Cuban Consul General of Toronto and Wilfredo Pérez, the Venezuelan Consul General of Vancouver. It will be a beautiful evening of art, poetry, solidarity and celebration as we welcome Gerardo to our city!